You’re ready to propose to the love of your life! Congratulations!! Now the big decision is… where to pop the question? 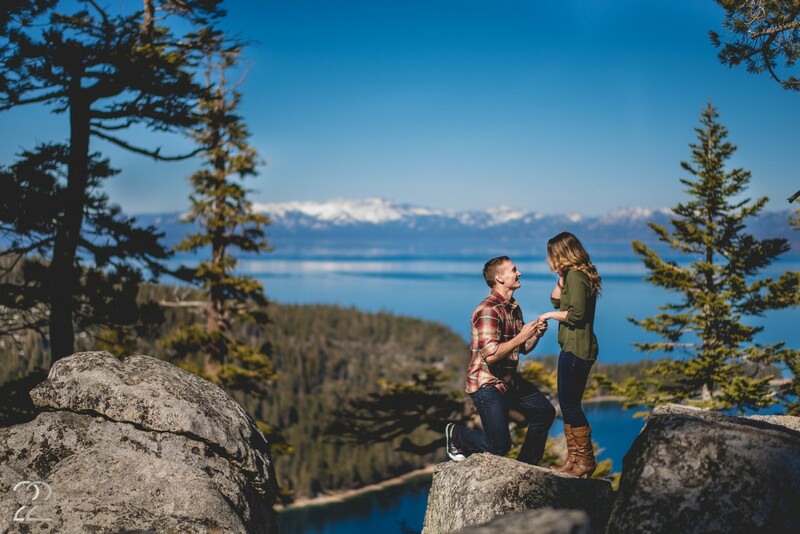 If you’ve decided on getting down on one knee in the Lake Tahoe area, we have some great setting ideas for you. Lake Tahoe is North Americas largest alpine lake. 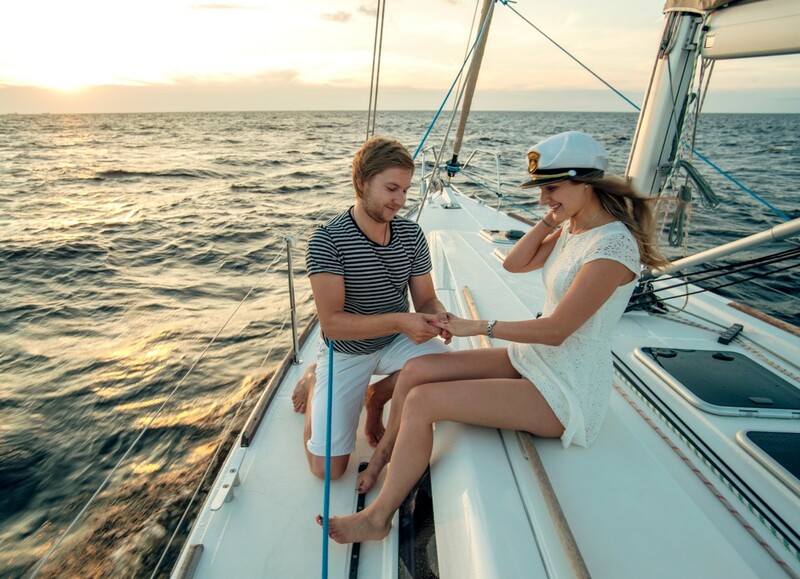 Make your proposal memorable by chartering a sunset cruise on one of Tahoe’s many sailing charters. Let the captain do the work as you cruise along the cobalt waters in romantic bliss. Bring along some fine cheese and a bottle of your favorite champagne to make the moment complete. More of an active couple? Make your way to Sand Harbor Beach, located just south of Incline Village. One of the most picturesque beaches in Tahoe, Sand Harbor is home to crystal-clear lake water, awe-inspiring rock formations, and stretches of soft, light sand. Enjoy a picnic and then swim out to a boulder. Or better yet, rent some paddle boards and glide along the glassy water surface as you surprise your significant other. There exists a place, a short and easy hike from the base of Squaw Valley, where waterfalls flow along granite rocks. The Shirley Canyon trail meanders along singing brooks and emerald pools. Pack some gourmet sandwiches and hike up to a private spot along one of the many waterfalls that spill out of the Squaw Valley mountain range. 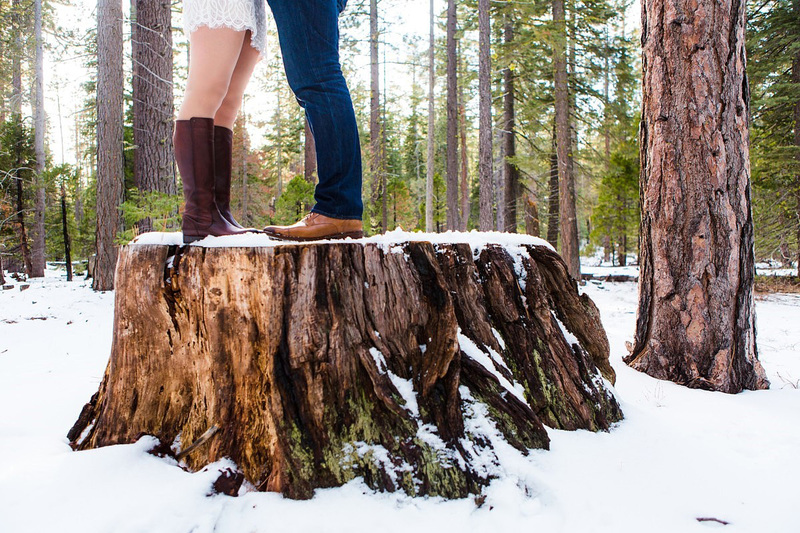 A proposal here is sure to create misty eyes and everlasting memories. If you both ski or snowboard, consider a winter proposal at the top of Homewood Mountain Resort. 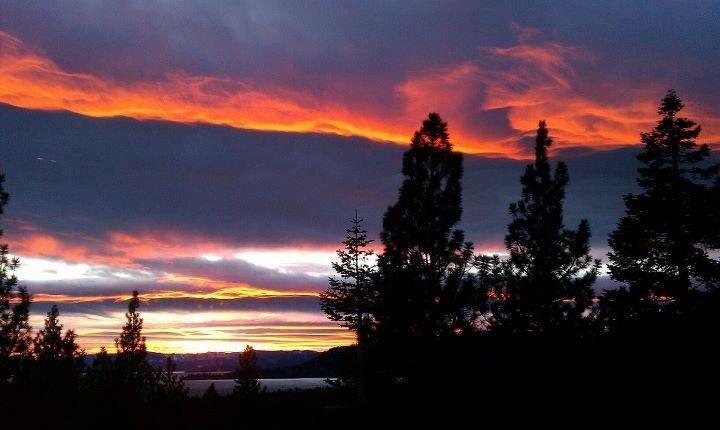 The view is stunning and offers panoramic views of the Lake Tahoe basin. After she says yes, head across the street to the West Shore Café and dine lakeside for a warm and romantic celebration. 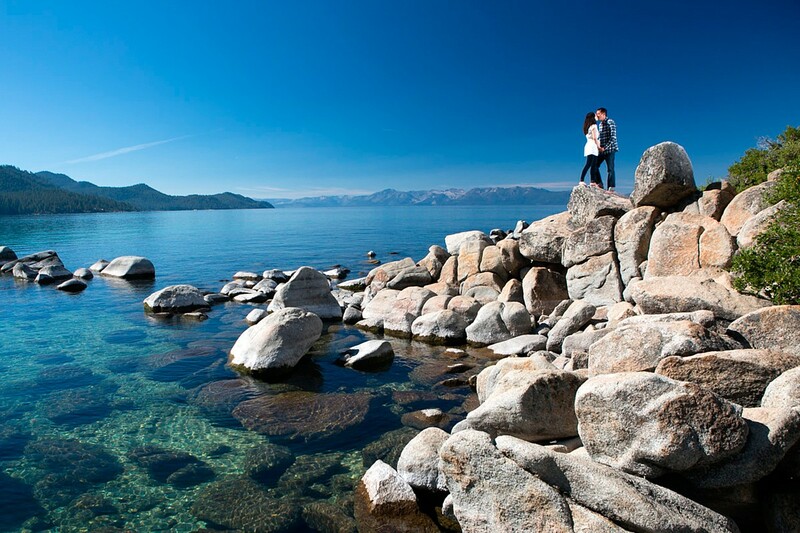 No matter what your budget may be, one of these Lake Tahoe locations will inspire a Yes! from your soon-to-be fiancé. 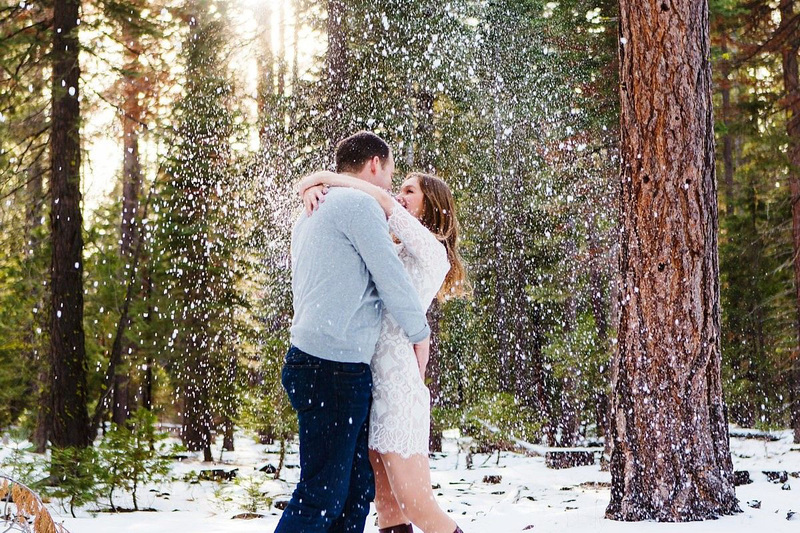 Be sure to bring a camera – or better yet, hire a Tahoe Engaged professional photographer – to capture the magical moments. 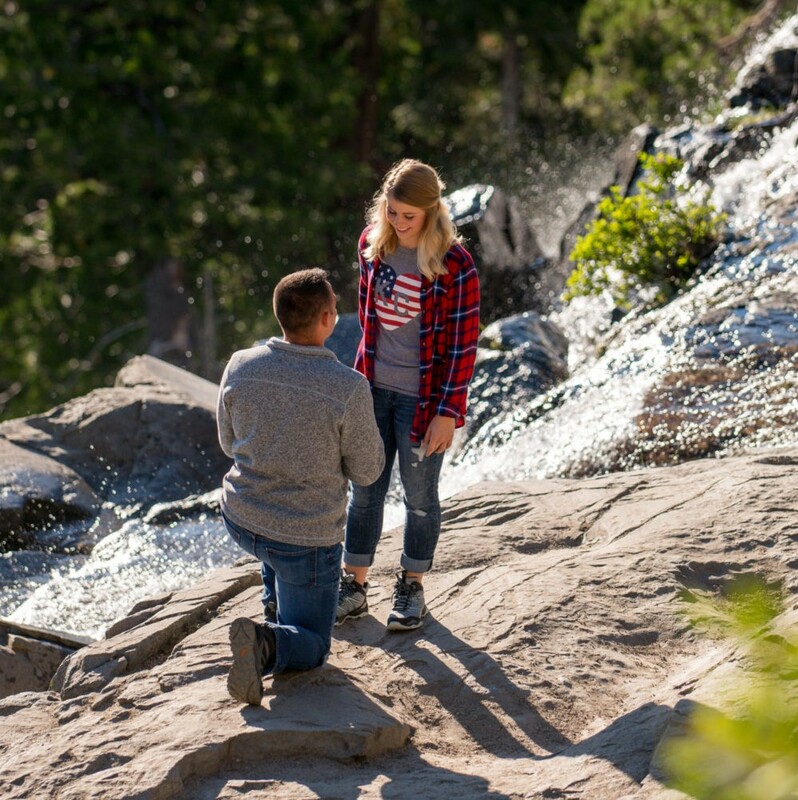 There is no better background for your proposal than Lake Tahoe, a waterfall, or a shimmering sunrise. Being green isn’t a trend, it’s a lifestyle, especially in the Sierra Nevada. 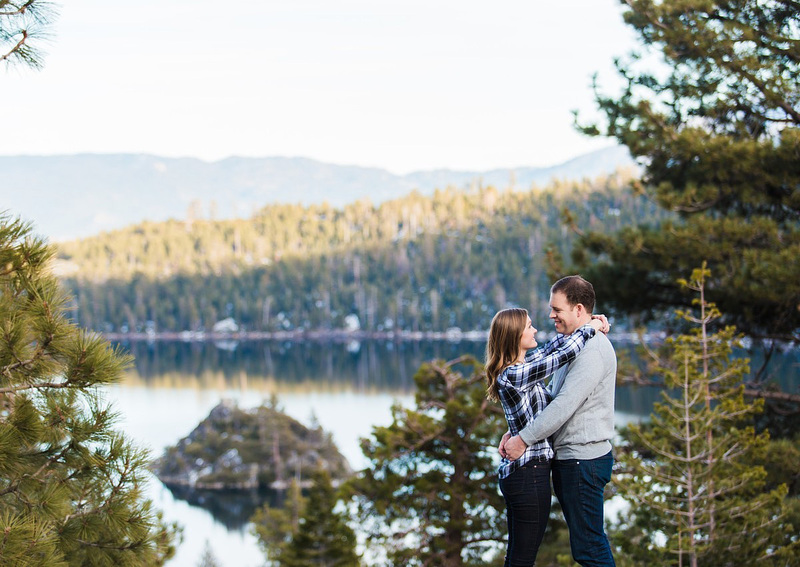 Environmentalism is the characteristic spirit of our Lake Tahoe culture, and as a wedding guest to our community, you can partake in our beliefs and aspirations too. 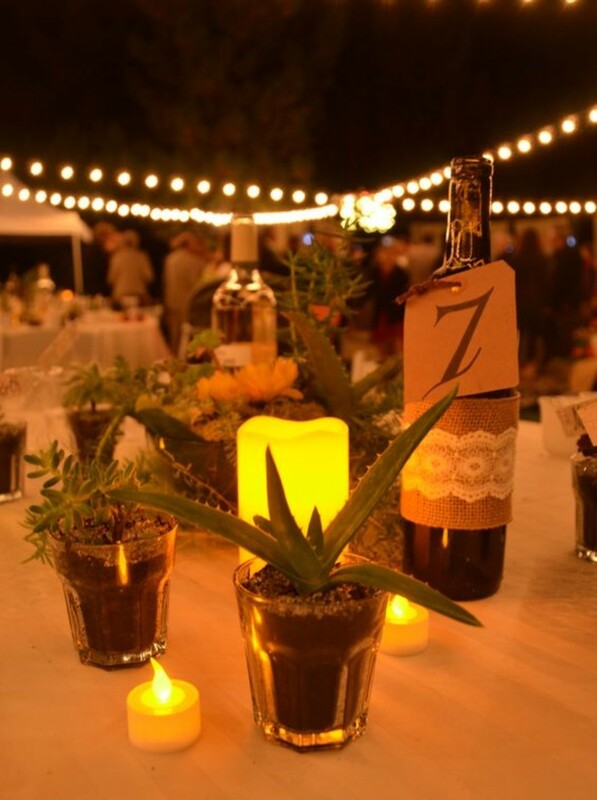 With just a few ‘in-the-know” tips, it’s not difficult for your wedding guests to be eco-friendly, and help keep Tahoe “green” (and blue)! 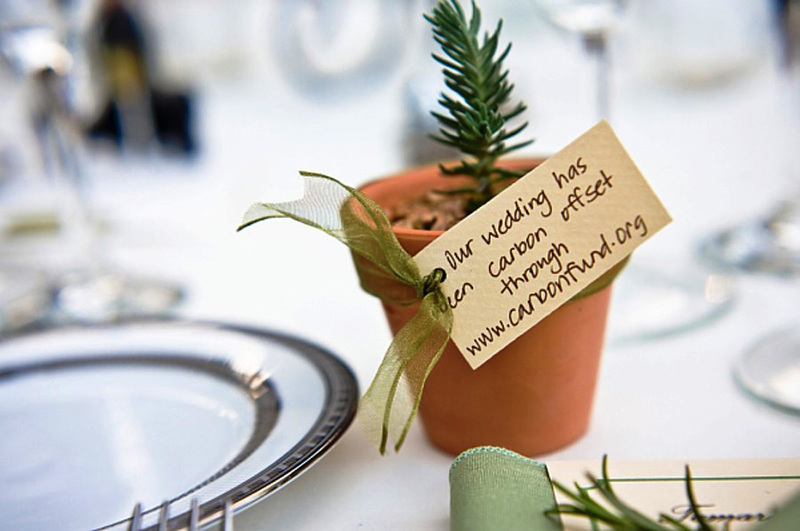 As a wedding couple, you can help promote sustainable modes of transportation to your guests. 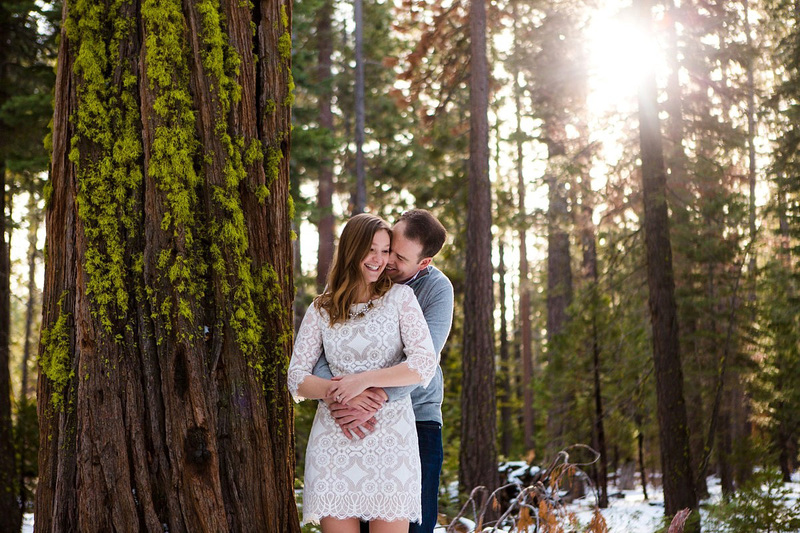 Anyone who is concerned about the impact of driving from the Bay Area to Tahoe for a Lake Tahoe destination wedding should consider riding Tahoe Convoy. A luxury weekend shuttle, Tahoe Convoy brings Bay Area residents to the Lake, traveling Eastbound on Friday evenings and returning westbound on Sunday evenings. Another green alternative is the Amtrak California Zephyr passenger train, which has a stop in Truckee’s Historic Downtown. 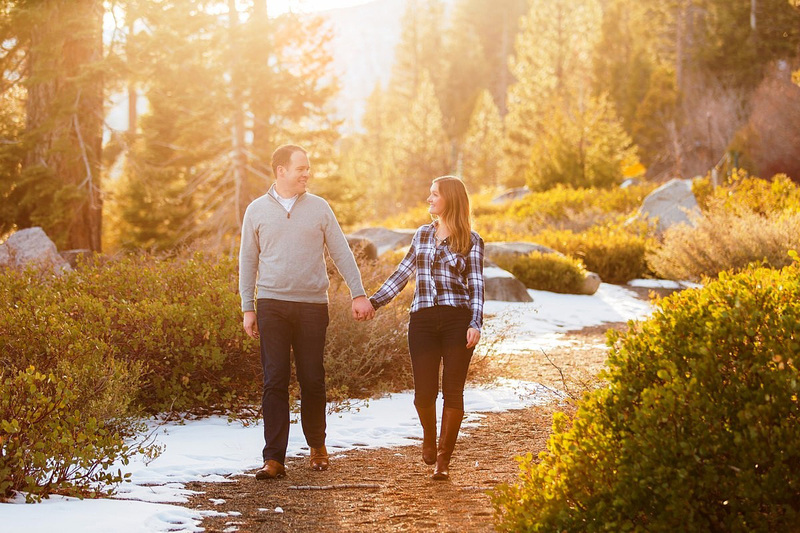 Once your guests arrive in North Tahoe, they can be car-free! There is a local bus system – the Tahoe Truckee Area Regional Transit (TART), an extensive bike path network, bike share systems, and multiple taxi operators as well as Lyft and Uber. 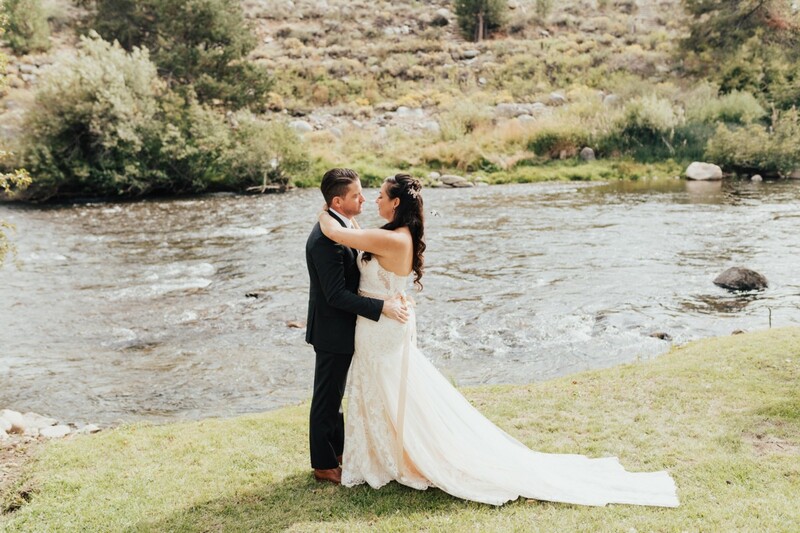 For the day of your wedding, Reno Tahoe Limousine offers a wide variety of group transportation options to take your guests from their hotel to the wedding location. Recommend that your guests stay at the Cedar House Sport Hotel, a “lifestyle hotel with a strong environmental consciousness.” The hotel was sustainably built using recycled materials and adheres to LEED environmental standards. (LEED stands for Leadership in Energy and Environmental Design.) Give your guests a gentle reminder that when they leave their hotel rooms, to please turn off all the lights and power down the thermostat. Once your guests have arrived in the Lake Tahoe region, it’s important for them to stay hydrated. 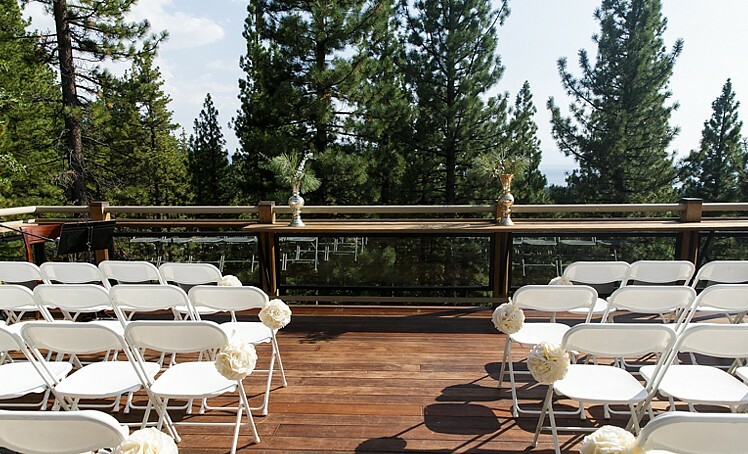 The humidity is lower, and some of the Tahoe wedding venues are perched on high-elevation mountain tops. 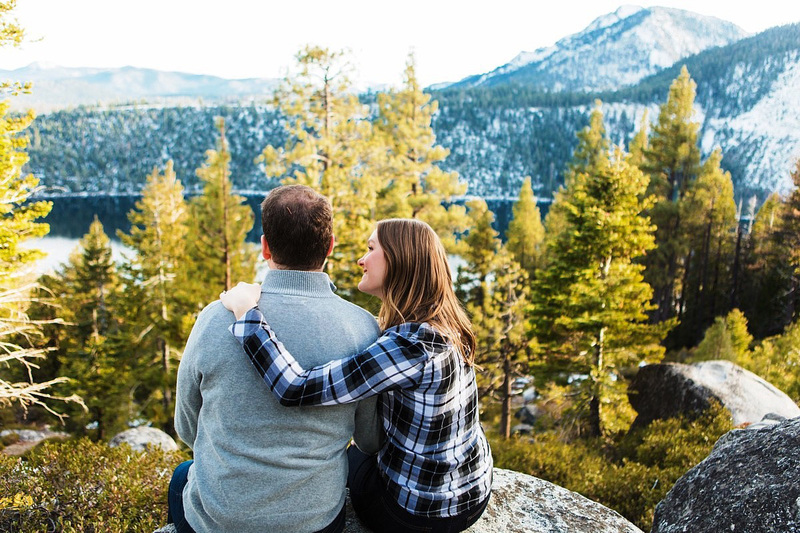 So, suggest that your guests bring a reusable water bottle with them during their stay – they can fill up at any of the fountains throughout North Lake Tahoe. 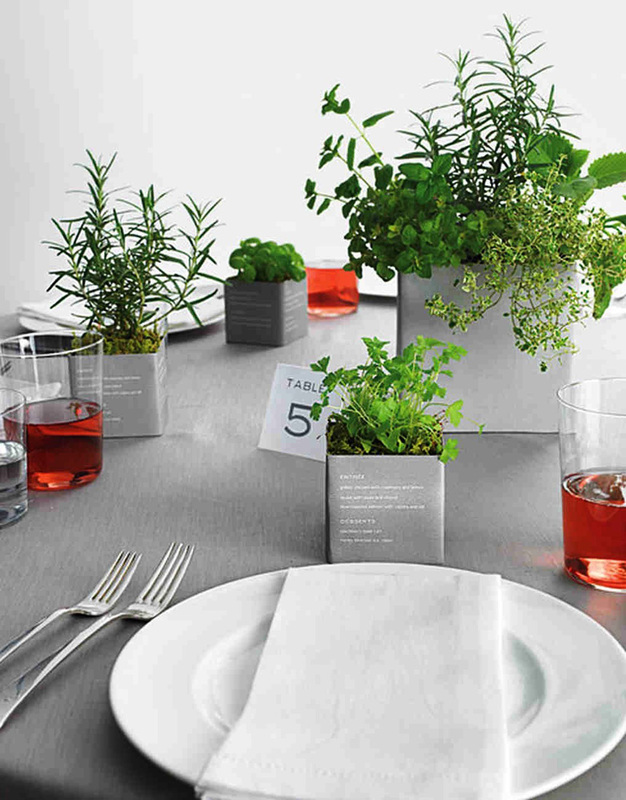 We hope you will make a vow to a green lifestyle and live environmentally ever after. Happy Earth Day each and every day! Unfortunately, for many people, this approach to picture-taking can result in photos that are… cheesy. 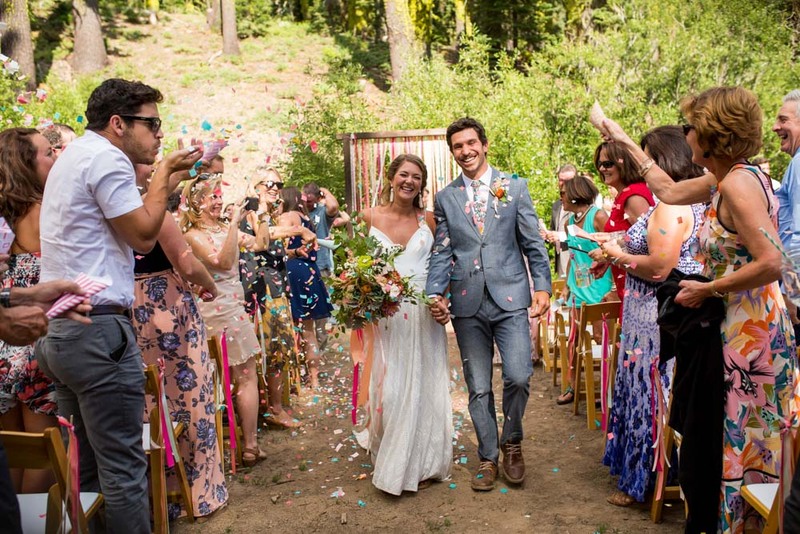 And if you’re an engaged couple with a wedding celebration approaching, this can be a cause for concern, because you want your photographer to capture your big day in a good light. But some people are naturally camera shy, or they don’t always put their best face forward for photos. If you remotely fit this description, we highly recommend you spend a couple of hours in an engagement photo session with your photographer. Of all the service providers (vendors) that you hire for your wedding, the one that you will spend the most time with on your wedding day is your photographer. So, not only does your photographer need to be a skilled master of his/her craft, but your photographer also needs to be someone that you are comfortable with. 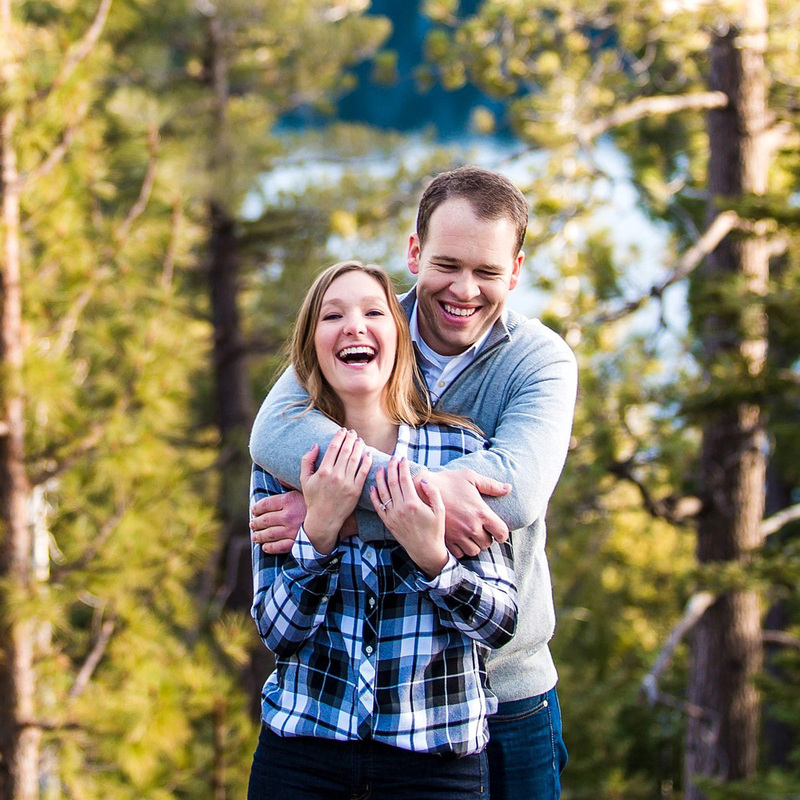 By scheduling an engagement photo session in advance of the wedding, you will get to know your photographer better and become more familiar with how he/she works. 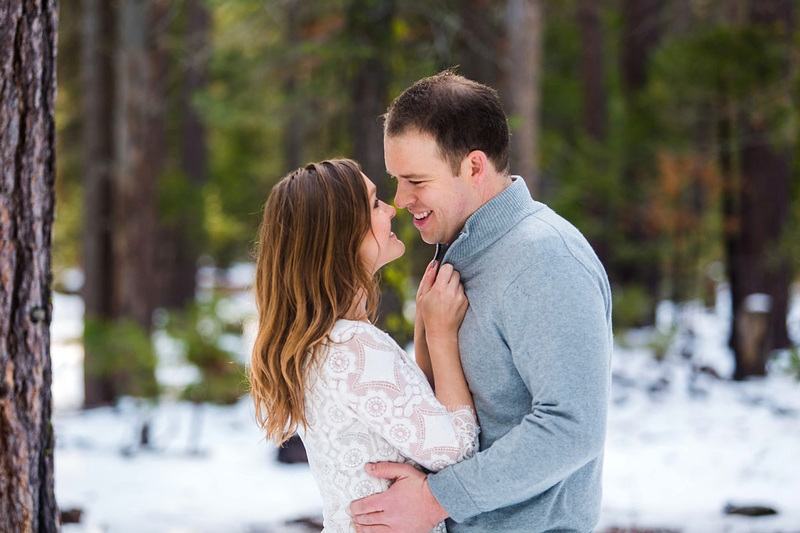 Meanwhile, your photographer will learn from the engagement photo shoot which poses and camera angles work best, and he/she will develop a better understanding of what kinds of photos you like and dislike. 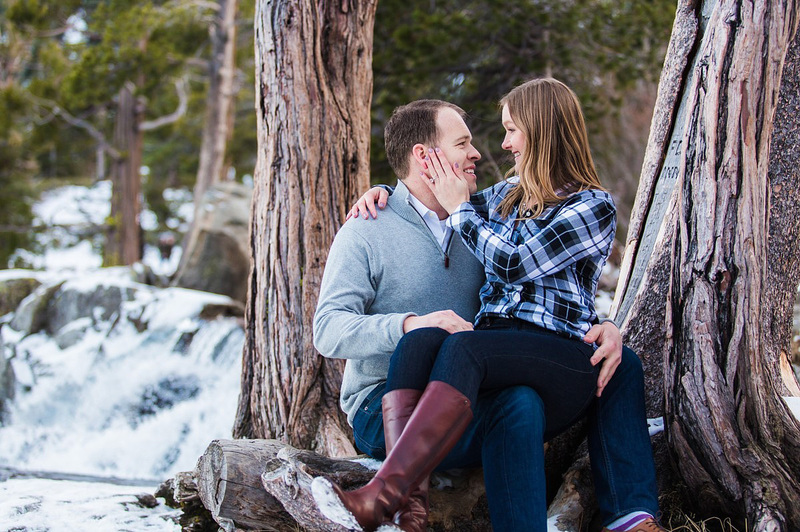 In short, you and your photographer both benefit from an engagement session, and that’s why many photographers offer wedding packages with an engagement session included. 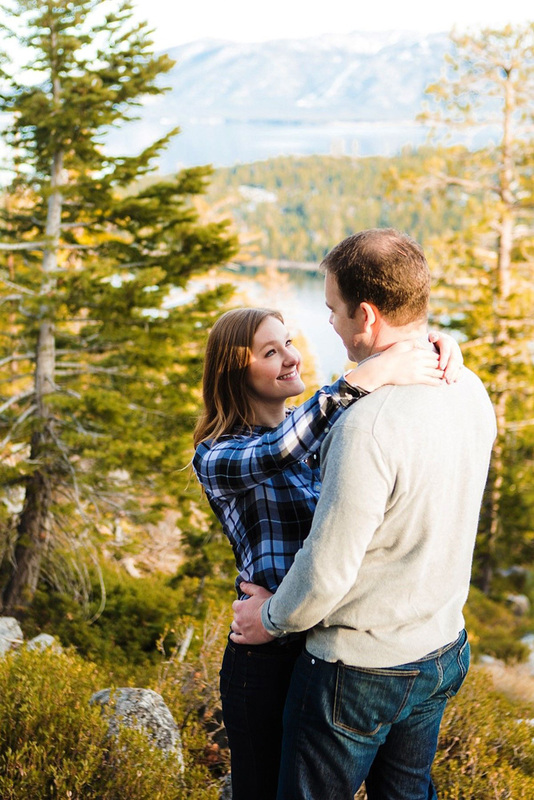 So where is the best place in the world to go for your engagement photo session?? Why Lake Tahoe of course!!! 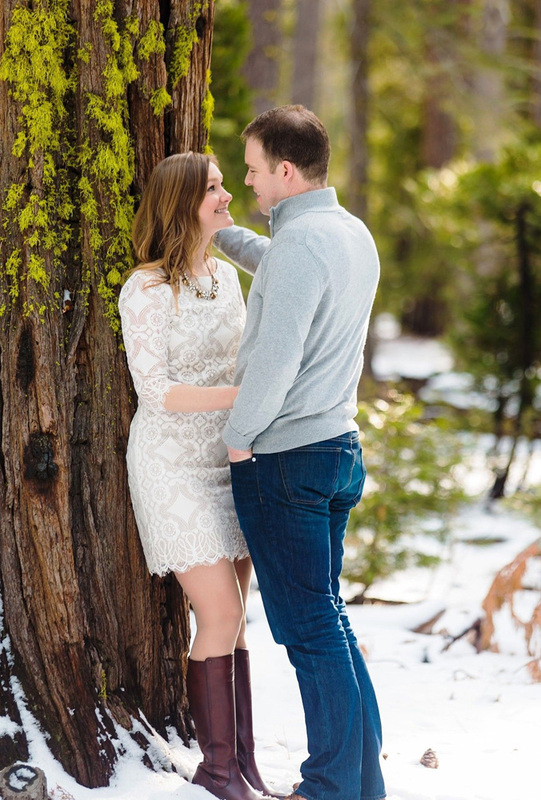 Their first photo-shoot took place at Sugar Pine Point State Park. The lakefront setting, majestic evergreens and some fresh snow provided a beautiful backdrop. 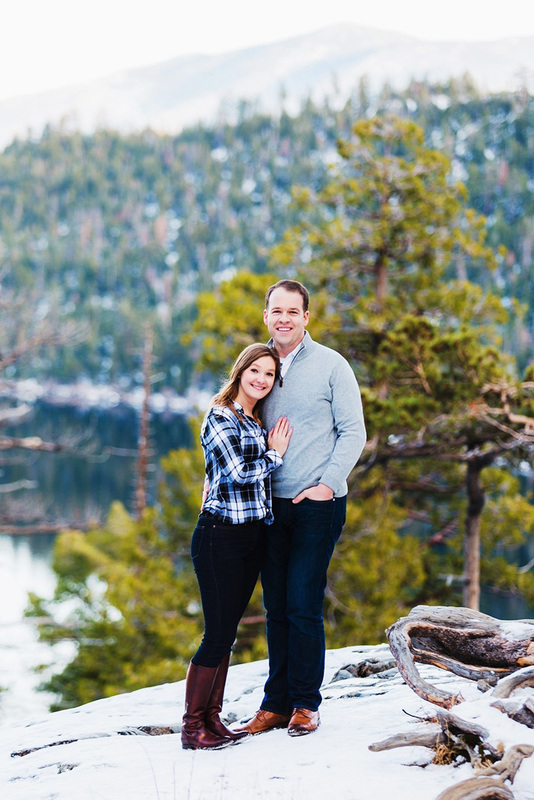 Next, the couple and their photographers drove down to Emerald Bay. There, the late-afternoon natural lighting added a warm glow to the world-famous vistas. 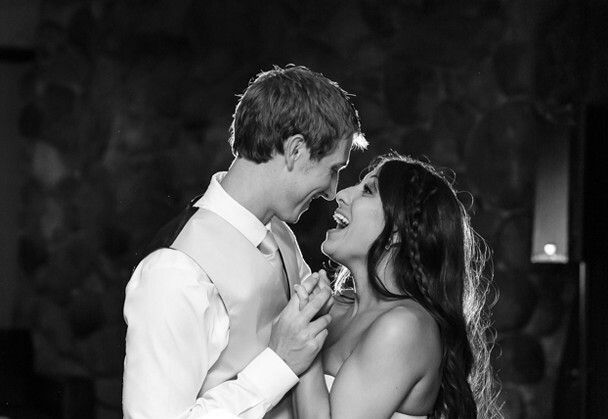 Secure your wedding day photographer first! 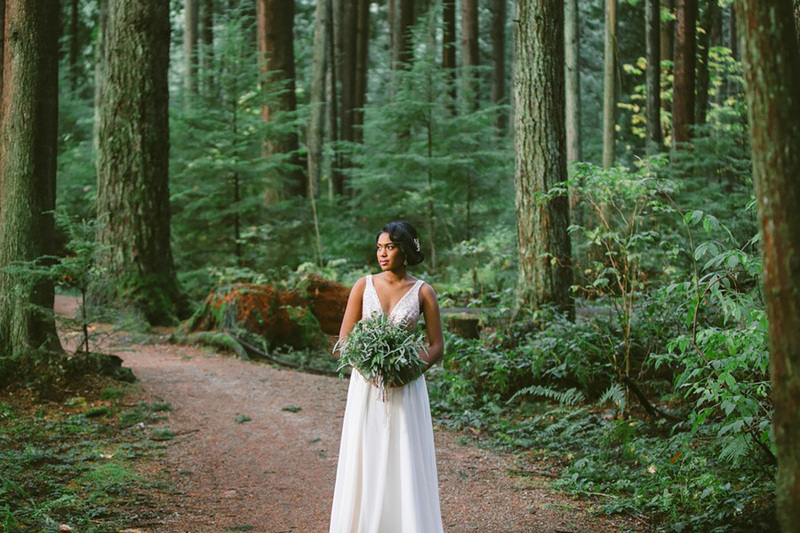 This photographer should be the same photographer for your photo engagement session. Decide on a geographic location and settings that are significant to you. 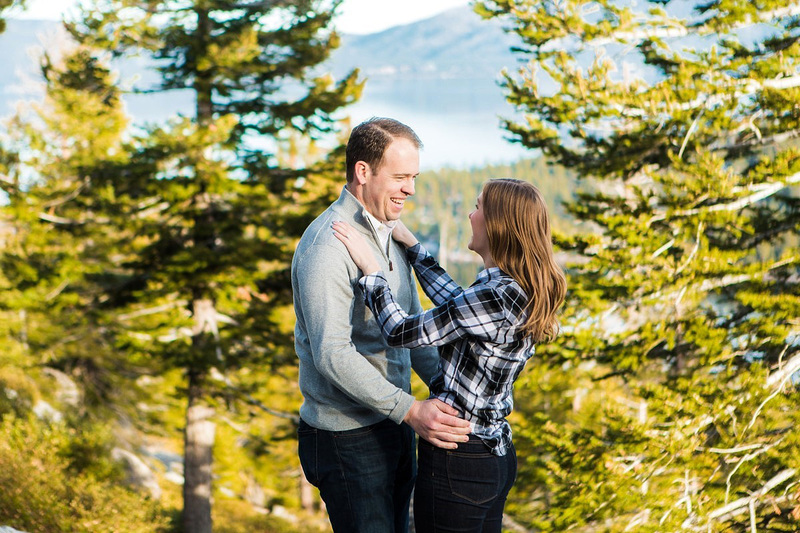 If you are an adventurous couple and love to hike, ski, or kayak on the lake, then Tahoe is the perfect place for your engagement photos. Wear clothes that you love and are comfortable. Select at least two outfits and avoid crazy patterns or prints. Consider having your make-up and hair done professionally. Makeup evens out the skin tone and gives a nice foundation base. 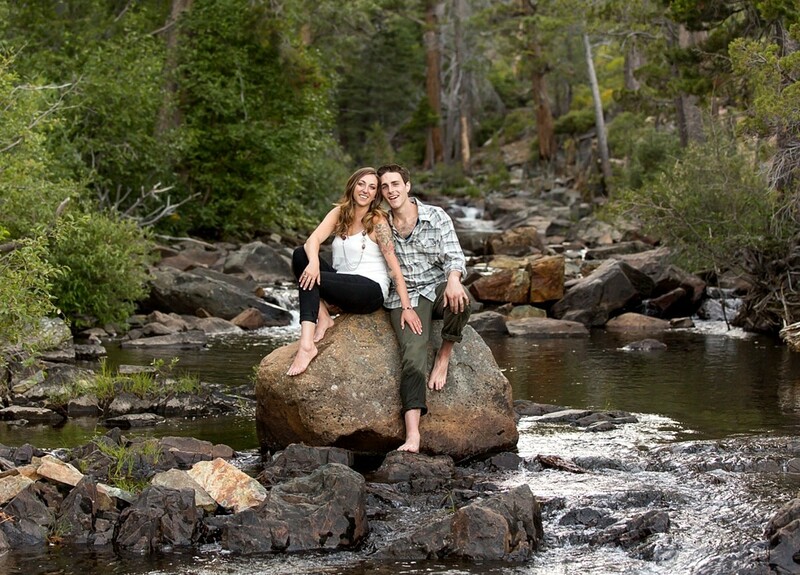 Schedule your hair and make-up trial to coincide earlier in the day with your engagement photo session. During the photo session, have light matte-finish powder or blotter paper available. Time it right! 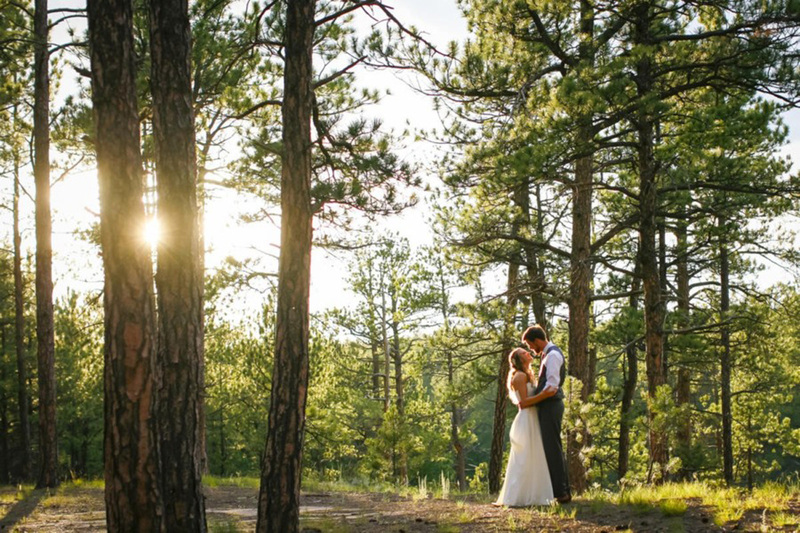 Your professional photographer knows the most perfect time of day when the lighting is magical for photos, so let the photographer do the scheduling. Typically, the worst time to photograph is when the sun is at its peak height. 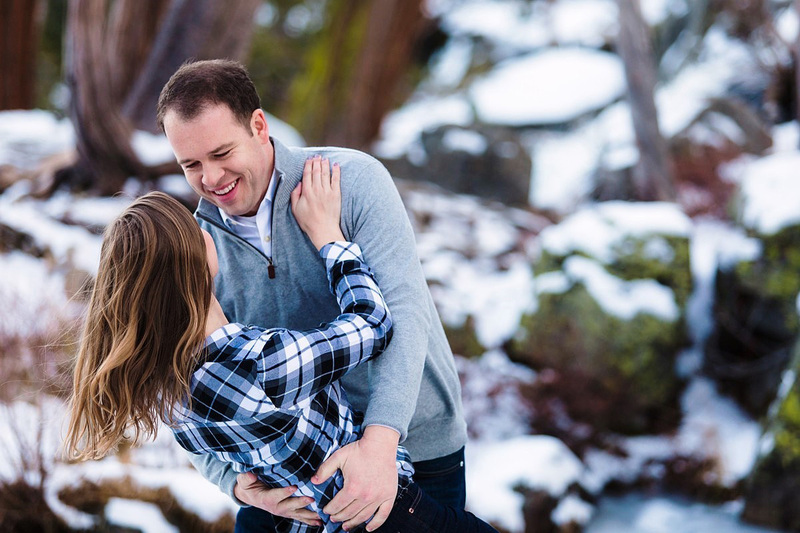 Allow for 1.5 hours to 2 hours for an engagement photo session. Come mentally prepared to let your love shine…have fun with it! Before we get to the Grille, let’s find out a little something about the man who runs the show there. Jack Chinn is no ordinary restaurateur – we think the term “Jack-Of-All-Trades” must have been named after him! Jack grew up in Southern California, and majored in Music at California State University Northridge. He was introduced to the hospitality industry at the tender age of 18, when Jack got his first “taste” of food & beverage service at a Chili’s Restaurant in SoCal. In subsequent years, Jack bounced (no pun intended) from restaurant to restaurant and bar to bar, working just about every position within the restaurant industry. But Jack is a man of many interests, so he took a break from the hustle and bustle of Southern California and landed a job with the Boy Scouts as a backcountry employee at Philmont Scout Ranch. For those of us who have never heard of it, Philmont Scout Ranch is the Boy Scouts’ premier High Adventure base, set in 214 square miles of rugged wilderness in New Mexico, offering backpacking treks, horseback cavalcades and training programs. Who wouldn’t want to be a Boy Scout if you could go there!? After a few years, California was calling again, and Jack’s sense of adventure was still flaming hot, so he became a wildland firelighter for CalFire! Unfortunately, Jack got injured on the job and needed to consider other career opportunities at that point. 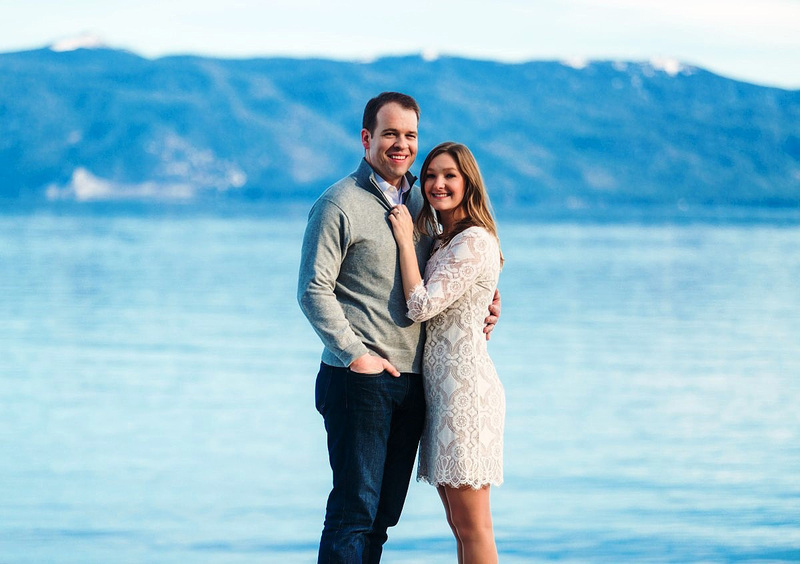 But this is where the good news begins for engaged couples – in 2016, Jack landed the most amazing job at the Big Water Grille as their General Manager and Event Coordinator! Perched above Lake Tahoe’s shores in Incline Village, the Big Water Grille is widely known for being a premier restaurant around the lake. 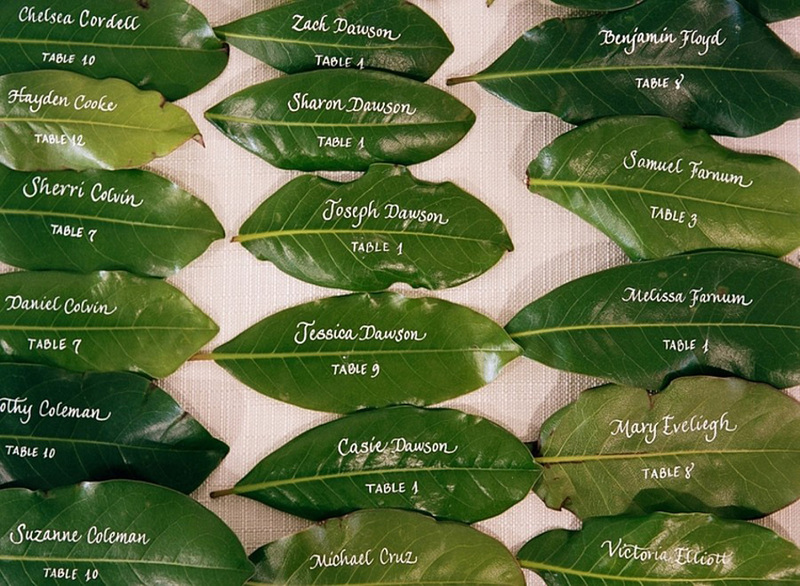 Jack has an amazing, dedicated team and an unmatched commitment to be of service to you and your wedding guests. 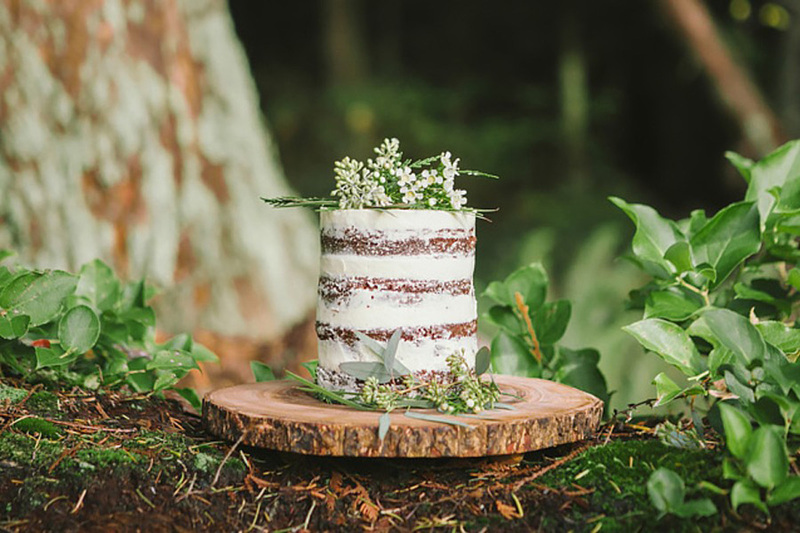 For your wedding, they create culinary memories that last, because the cuisine is exquisite – seasonal, fresh and local. 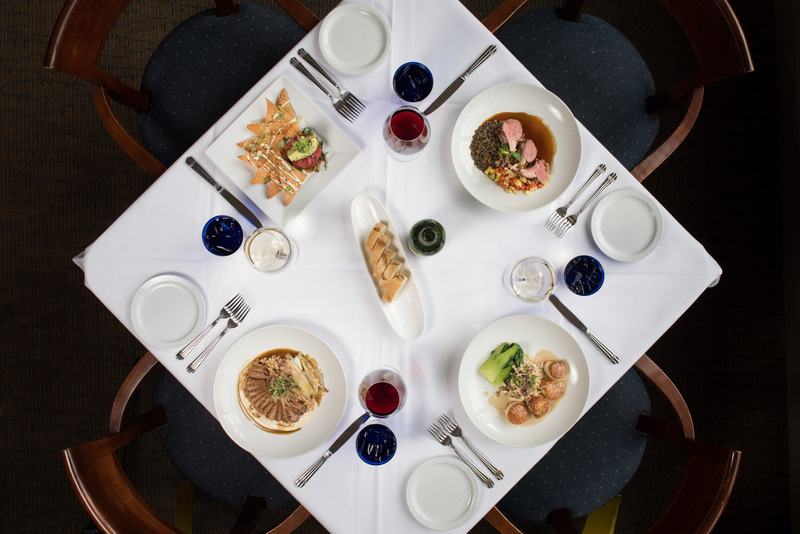 Chef Manny Baez works diligently with each wedding couple to create an award-winning menu. For ceremonies, The Big Water Grille can accommodate your guests outdoors on their deck overlooking the lake, or in front of their large river rock fireplace for cozier winter days. Immediately after the ceremony, your reception will begin with butler passed hors d’oeuvres and premium cocktails from their bar. Dinner is served in their multi-level dining room with spectacular views. After your scrumptious dinner, you can celebrate in style on the dance floor. 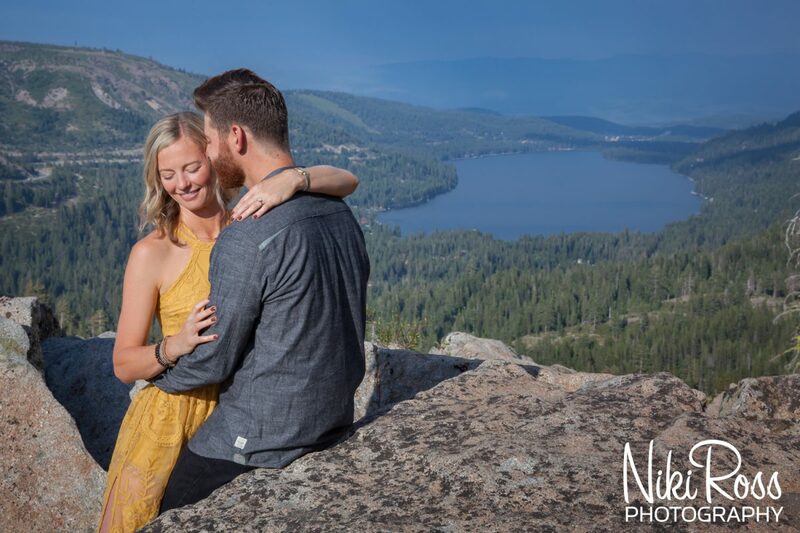 Jack promises you uncompromising attention to detail and an “elevated” dining experience for your North Lake Tahoe wedding! For more information about having your celebration at the Big Water Grille, please call Jack at 775-833-0606. Our hearts go out to everyone who has been affected by the horrific Wine Country wildfires. Included among those who have been impacted by this terrible devastation are venues that host weddings, and couples who booked their weddings at these venues. Many couples in this situation are now wondering what they should do next, if their venue can no longer host their wedding. First and foremost, review your venue contract. Typically, there is a standard clause in your contract that addresses this kind of circumstance. This clause might be labeled “Termination,” “Force Majeure,” “Acts of God” or “Impossibility.” It allows you and the venue to terminate your obligations (the venue’s obligation is to provide space, and your obligation is to pay the venue) without liability, if it is impossible to have the wedding at the venue due to Acts of God, which include fires, earthquakes, floods, tornadoes or hurricanes. So if you have a clause like this in your contract and your venue is not able to host your wedding, you may terminate the contract and receive a refund of the payments you have made to the venue. 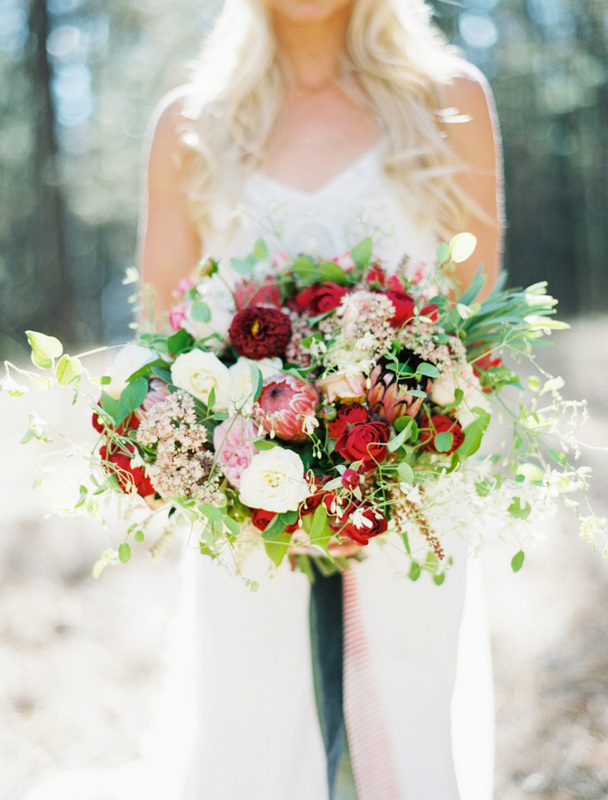 Once the contract is terminated, you can look for a new venue for your wedding. 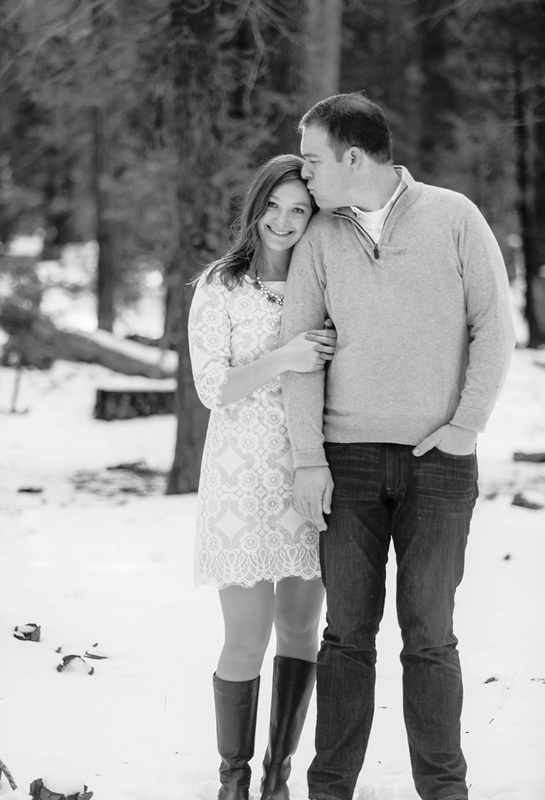 Below we have compiled information from wedding venues in North Tahoe that may be able to host your wedding. Clicking on the venue name will link you to the venue’s website. When specific available dates are provided by venues, this information is accurate as of October 12, 2017, but is subject to change as bookings take place. Contact Jack Chinn, General Manager, 775-833-0606, [email protected] to inquire about available dates. Jack was once a Firefighter for Cal Fire and wants to help. All Saturdays are available for the next few months with the exception of 10/28 and 12/2. We have full availability for the rest of this month at the Gatekeeper’s Museum. Saturdays in April, May and October 2018 are still available, but June – September are fully booked. We also have quite a few Fridays and Sundays available if anyone is interested. A buyout of the restaurant required for groups over 70, a banquet room is available for groups under 70. 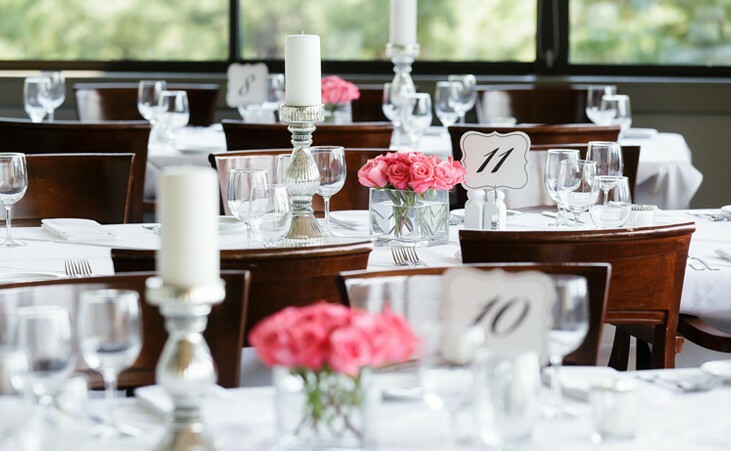 For wedding groups of 75 guests or less, the Tavern 6330′ restaurant has available dates. The Ritz-Carlton, Lake Tahoe does have availability for various dates for this Fall Winter 2017 and next summer 2018. Below are our available dates for 2018 on the weekends. We’d love to help out as much as possible. Unfortunately we don’t have anything in October available. In November we have the first weekend 4th and 5th, 18th and 19th, and 25th and 26th. 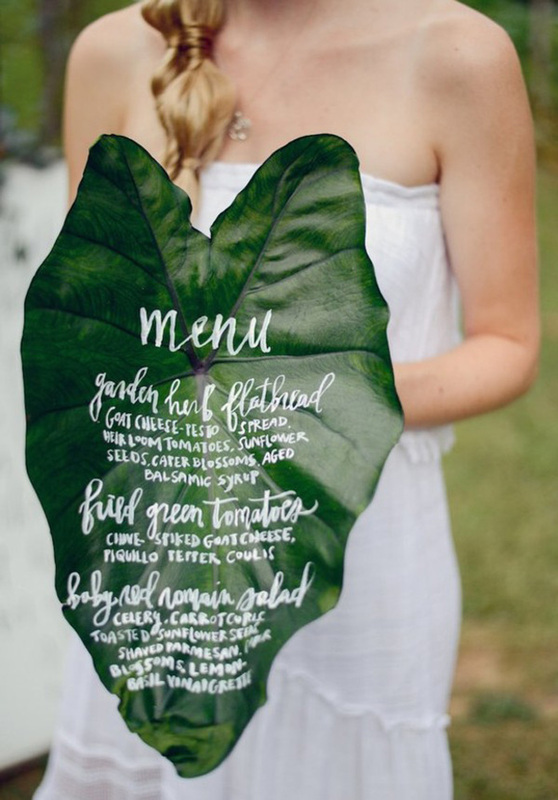 We are also available for rehearsal dinners as well. 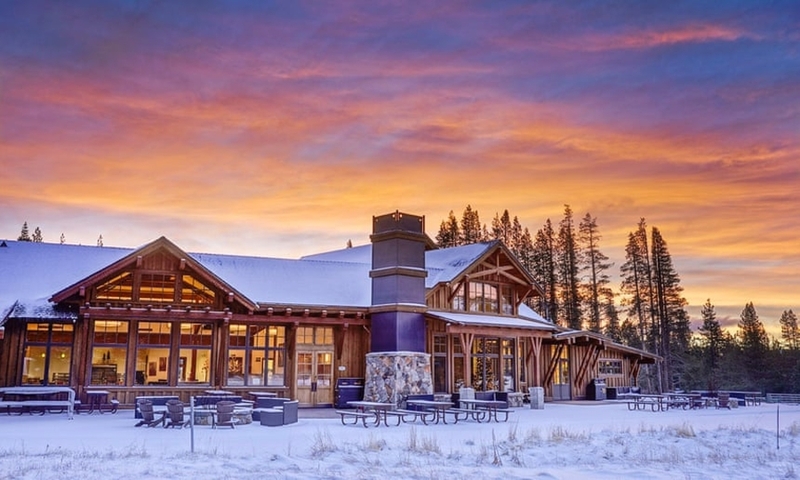 We could offer up a full buy-out of the Lodge, which can accommodate 175. Site Fee TBD. Same dates apply as above. We are definitely open to helping and can offer our venue as an option, and would love to talk further with the couples.